This is one of those Connecticut things that everyone should know about. I’d heard rumors about this ferry on the dingy back streets and grimy tenement alleys that I frequent for the skinny on secret museum happenings and such. “Arrr, she be crossin’ the river — ” You know what? I’ve veered too far. Now I’m writing conversations with fictional alley-dwelling pirates who have an unhealthy obsession for Connecticut historic landmarks. I’ll stop. ‘Tis true though, right here, in our fair little state, runs the oldest ferry in continuous use in the country. Pretty cool, I think. 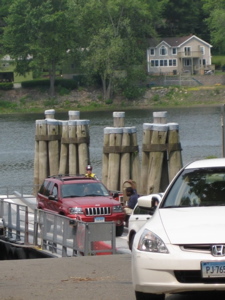 I had planned my day’s route to cross the Connecticut River via the ferry – which was extra exciting because I was doing it on Connecticut Open House Day – which meant it would be free! 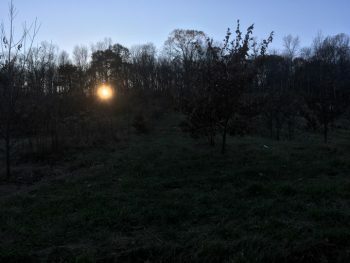 After finishing up over at a little in Glastonbury, I drove down one of Connecticut’s designated scenic routes, Route 160. At only 1.06 miles, I figured that would be the shortest one in the state, but I was wrong. (There are several under a mile.) And honestly, the road is really pretty lame and not very scenic at all; it crosses a flood plain dotted with rows of corn to the ferry landing at the river. Aha! The trick is that the ferry is actually part of Route 160 too. So therefore, designation approved! Upon arrival, I was pleased to find only two cars ahead of me. This meant I’d make it on the next trip – yes, this thing only ferries 3 cars at a time. I waited and walked around the pleasant little riverside park. Some cyclists milled about and an elderly lady was chatting everyone up. She was even more excited than I about the free fare for the day. 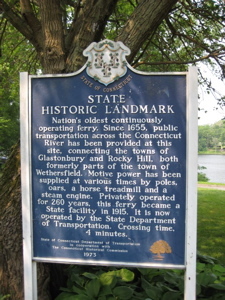 The nation’s oldest continuously operating ferry service crosses the Connecticut River between Rocky Hill and Glastonbury. The original ferry, which dates back to 1655, was a small raft pushed across the river using long poles. 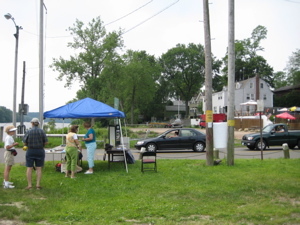 Under State charter, the ferry service was operated by local families throughout most of its existence. The ferry service was such a vital transportation link within the region that crossing would cease only during the most adverse conditions. 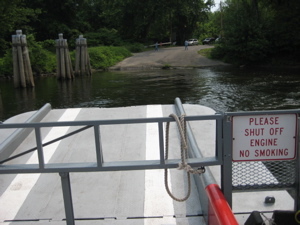 When river flood levels escalated, the ferry would use alternate landings such as the old coal dock in South Glastonbury, or the ferry operator would skid the craft across inundated meadows to an old dock near Tryon Street. At one time, a horse on a treadmill in the center of the craft supplied the power to propel the craft across the river. 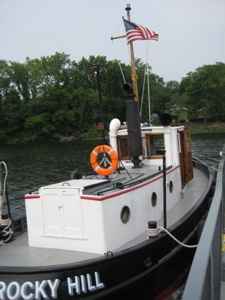 In 1876, the ferry was “modernized” into a steam driven craft. Today’s craft is an open flatboat named the “Hollister III”. The three-car barge is towed back and forth by the “Cumberland,” a diesel powered towboat. 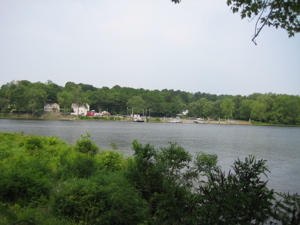 The Rocky Hill – Glastonbury Ferry is a seasonal ferry and has an annual average daily traffic of 400. The ferry is the only river crossing accessible to pedestrians and bicyclists between Hartford and Middletown, preventing what would otherwise be a thirteen mile detour for them (It would be about 8 miles for cars). The ride is a bit plodding but very smooth. The landing was soft and accurate. 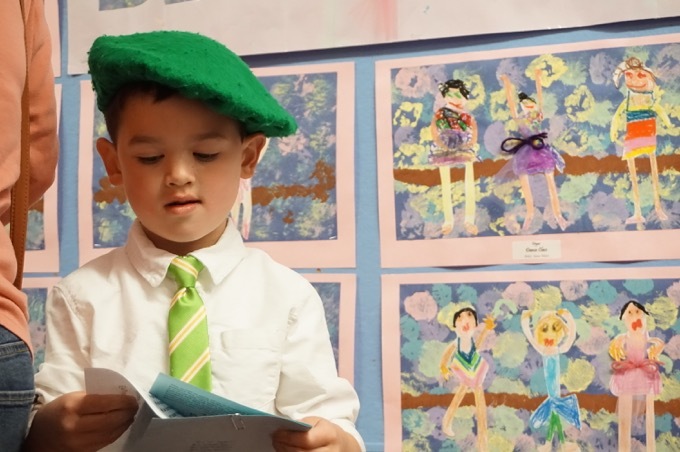 And that was that… on to the Captain John Francis House in Old Wethersfield! We took this ferry last year just for the heck of it! Meg was quite excited about the “boat ride.” My parents use it quite often as well. Fun times! The Oldest Ferry? I expected to see an old, beat up, falling apart wooden boat that I wouldn’t trust holding my backpack. Now that would be old… This however is just the longest continuous river crossing service. Then again continuous is sort of a misleader since they are closed several months during the year. Not that I hadn’t previously known this, I just didn’t want another CMQ fan to plan a family Christmas ferry ride only to be disappointed once they packed the family in to the car drove 90 minutes just to get there, with all the kids crying and screaming the whole way, “are we there yet” then discover the crossing is closed and we wont make it to the Essex Steam Christmas Train. That could ruin the holiday spirit. Not that I have done that… no not me.. oh and whats the big deal about bringing a fishing pole and doing some trolling while your making the trip. How would I have known that a fish would get caught on the prop and break it, then shut down the ferry for weeks? Next time I will try fly fishing. That should be much better.